Project Killer [for now] Murder mystery with a twist! 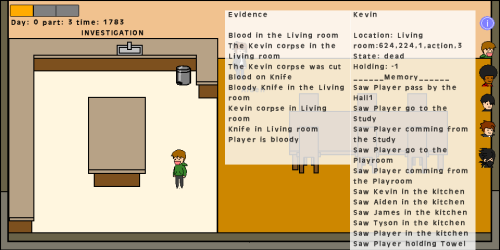 TIGSource Forums Community DevLogs Project Killer [for now] Murder mystery with a twist! Project Killer is a prototype of a murder mystery from the point of view of the killer. 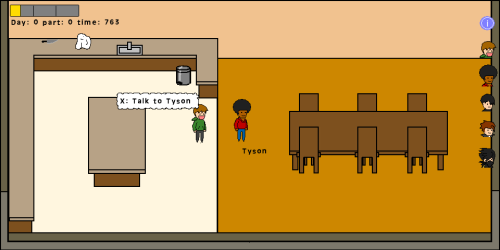 When it all works it is to be implemented in a full murder mystery game. Just walking around, peace time does exist! Where you can talk to others, build bond, trust and information. Do certain activities to improve your abilities and pre-emptively prepare your plan. You can also learn the schedules of people. If you kill someone you go into coverup mode, its actually no different from freetime except someone else can trigger the investigation at any time if something suspicious is found. Is what separates the day time periods, its also a way to make sure everyone is still alright. Everyone goes out and search for evidence. So do you. You can talk to others to know what they have found and know what they remember from the time of murder. Where you try to convince everyone that you didn’t do it. -Very simple, approaching another person with a weapon equipped will add “Kill” option. -A stronger opponent could counter, making it your loss or even death. -Betrayals and surprise attack can be quite effective. -They have their own lives, go places interact with others, notice when stuff is off and remember who they see. -Murder seals that what they saw is relevant: You can’t say you weren’t somewhere someone else saw you. -Scratch the above, you actually can! But it doesn’t work if 2 or more saw you. -They follow a schedule (not strict) so you can kind of predict their action, You can also guide them (ask to meet somewhere) But so can others. -So essentially your goal is to make others as possibly guilty as you if not more. -The main threat during the cover up is being seen by someone else. Id like it to be as organic as possible but that might be quite a challenge. -Would work on trust and like a battle. Two stats: Credibility & suspiciousness. While both are quite linked, they differ in how recoverable they are. While you can regain credibility, suspicions are very hard to remove. -there is no predetermined path or ending the trial ends when someone (could be you) demands the vote casting and no one objects. For that to happen, everyone should have an idea of who did it; but that doesn’t say anything about what happened in the trial. Forgive my drawing skills; Here is an early screenshot. Freetime, with a conveniently available knife... wonder where that goes. note: the face icons on the sides are part of "dev vision" please ignore. So what do you think interested? Art acceptable? How are you going to do this?!! Looks interesting? I look foward to my next entry. Re: You thought it was [insert innocent person] but it was me! The Player! Hey, I think this is a really great idea. Looks like it will involve a lot of time to program though so I'd start off somewhere simple and then gradually add features if I were you. Anyway, really this is a great idea for a game and one that I definitely think could be big if done correctly (if it hasn't already been done!). Yeah, keep the idea, run with it - it's definitely a keeper if you can make it. ← Avatar from my Healing Process: Tokyo. 3 years in so far. Daily dev-log is here. I have advice for composers looking for work, join here, I'll tell you. I think it looks alright if he keeps it consistent. cactus-esque. Thanks for the encouragement and tips, its is indeed quite challenging. Im starting with covering all bases, although in no depth. Its bit odd but It allows me to know everything I want to do is possible then I can expand on them. I want to have a lot more done before looking into stepping up the art. Before that point, ill try to keep things simple, Not an all out attempt that stills falls flat on its face, nor stickman, im aiming for simple with its own charm. But between ''charm'' and proper talented art, I prefer the latter, so i'll definitly look into it. As I explained in the first entry, Freetime is spent with no specific objective. The bar on top is the current time. It shows the current sub period(the 3 lines). That is to say someone can be in the kitchen all morning, living room all afternoon and in his room all night. OR kitchen in early & mid morning but Toilet in late Morning etc. Every period (morning etc) Is separated by a meeting time. In the meeting time everyone will gather in the kitchen and eat I guess. The meeting is used to make sure everyone is alright. Someone missing triggers an investigation. I might also make stuff happen during some of them; easter egg like events. While not necessarily relevant, it is possible to determine/search for the specific sub-period, granting alibies. At the end of night there will be a wipe (change of day) There will be a reset of everything. Im sorry but I (and you) can only keep up with so much information. This means a murder can only take place over 1 day. I MAY add some inter-day interaction or carry overs but so far I can’t think of anything. Needless to say, the others see stuff and will remember it. Here is a screenshot with the dev-vision (won’t be visible in the final game) but you can see the info the other recoded. Well, I guess ill try to tell a story with my screenshots. And now the player has a towel… what Happens next?! Another entry should come shortly, because I want to implement a bit more stuff. The next one will discuss the actions. As always feedback & comments are appreciated. Really interesting concept, I hope you nail the systems, looks like it's going in the right direction! "If you were to write a story with me in the lead role, it would certainly be... a tragedy"
"You have to tell your hands to freaking do the stuff until your hands know it by their tiny hand hearts"
Thanks a lot! I hope it all goes right too! your contribution is appreciated! Took me a bit longer than expected... some unexpected encouraging (Wink) stuff happened. In todays entry id like some input on stats as gameplay element. It is detailed at the end of the post. -Hang out: Goes in a “visual novel” mode to share a bit of the personal story of the character. You may learn pertinent stuff about their schedule, or just learn some interesting facts or maybe feel that person shouldn’t be killed. This also increases your friendship. -Plan meetup: Ask the other person to meet you in X day at Z time period At Z location. The other will decide whether he does or not based on trust. There will also be other ways to make a meet up. You use left/right arrow to change the element to edit (day, time, location); up/down to change its value. Its really straight forward and simple and functional! Pretty proud of that one. Disposed: You can put the objects in garbage(and later more object) and pick them up from there too. Disposed of items, have less chance of being found by others during investigation. When next to someone you can kill (or attempt to) I have thought of new ideas for how to make it work, but writing it down didn’t feel right (in terms of explanation) ill try and make mock ups for next time. Today however id like to discuss Stats. Intellect: gives ideas(literally telling you things you can do) &/or unlock the ability to do things. Training those stats would be another action you could do. What do you guys think? Any suggestions? Should they be highly influential, not influential or not present at all? Yeah, that's a good way to go IMO. Focus on programming at first with art that does the trick well enough, and if the game ends up being an interesting proof of concept, a dedicated artist should be easy to find (if you want one) and will pretty much have finished templates and plans for all of the art that needs to be made and can just work away. @Prinsessa thanks! and what you're saying is exactly what i'm aiming for. Ok, so I managed to make the mockups I wanted to, I know they are not very good looking, but they should at least give a good impression of what I am thinking of. This is kind of weird because it is both a minor and major element of the game. On one hand, it’s only the act that links the freetime interaction with coverup/investigation & trial. But on the other… it is THE kill, I don’t feel its right to make it a simple button press, even though the true fun challenge comes after. Two new ideas I thought of. Doing kill next to a person triggers a comic book sequence with quick time events. And slightly branching path depending on the action taken. Exemple: first panel focus on knife; three choice pop :Stab, Cut, Grab → next panel(s) shows up depending on your action, until next choice happens and so on. Result depends on the sequence you took opponent (reaction may differ), location (possibilities may differ too). A true sequence would have more choices, that one also benefited of being a surprise attack. • Assuming I (will?) have a good artist, it would look pretty good! • The making of: All the art and alternatives! I guess it wouldn’t be so bad If I left the victim & location “grayed out” so it’s the same sequence for everyone. But that cancels out the pro of more care. • Limited, once you know the sequence of events, well you can’t really fail anymore. Doing kill triggers a rock-paper-like battle sequence. Every round gives Attack/Defend/charge and the choice of player and victim clash. In the exemple, the victim was not surprised thus reacted appropriately. • Attack> hurts someone wide open, charging or fleeing. • Charged attack> Will still hurt someone defending, Will deal critical damage to wide open, charging & fleeing. • Charged defense> Will hurt someone attacking (counter), will avoid charged attack. • Fleeing> only available to victim; tries to head to nearest exit. • Reach> appears when opponent is out of range. • Stays in world, not really fancy next to a cool comic, but doesn’t break the experience. o Enemy can flee, the same he would not in freetime. o Enemy could defend himself with items that happen to be nearby. o Blood splatter/ evidence are create in real time. • Always fresh and full of surprises, the opponent can act randomly since there is no premade sequences. • Did objects in the room get broken in the encounter? • Did the victim have the opportunity to call for help? • How dead was the victim after the encounter? Could it leave a final note? • ? stress level? Reduces carefulness (opposite of luck) may reach observable level. It would rise with how long (not according to plan) the kill went. Really cool idea! I definitely see some Dangan Ronpa influence which is awesome. I will definitely keep an eye on this. Keep up the good work! Thanks a lot! I really appreciate all the support, its quite a challenging game to make, but a concept I feel worthy of the ordeal! in the meantime still looking for feedback & ideas on the kill method (entry 3). So far I'd say the "kill battle" is winning, so please voice any OBJECTION! (ok... sorry) or suggestion. Well I definitely think the comic is much more visually interesting, but for game play purposes the battle seems better. I think this concept is really cool. 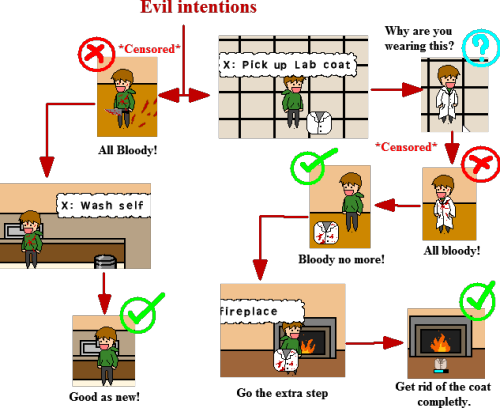 On kill method I think the comic strip looks much cooler, but couldn't you still combine that with strategy, somewhat. For example, if you're including the stats, strong NPCs could have a chance of your grab failing etc with NPCs gaining abilities in the same way as the player? I definitely think you should try to make the comic work as well as you can. Seems pretty much everyone agree the comic would provide more interesting visuals but might not be ideal in gameplay department. Funny this was a pretty straight foward suggestion but I didn't think of it myself. I thought of literally fusing the two. It kind of gives me the worse of both worlds (in development) but should provide the players with something decent. It all struck me when I realised... why do I write the events in the battle? I mean I like a little description, but that felt dull. Its also obvious I couldn't deliver quite complex animations (& emotion) with the Battle method. In terms of layout I think there room for improvement, the mockup is also smaller then full screen, so the strip wouldn't be a small little bar like it is. Part1 & 2 are different in the way panels appear. while sliding in is fancy, I think ill just go with simple appearing. What do you think? I know the concept of "i'll just fuse both idea" often leads to something worse, but I think it could work. I'll keep on listening for anything on kill method, as I said its something ill work on later so theres still time to really think things through. So do not mind bringing it back up. When you kill someone, evidence is generated by the death, what it is depends on the weapon and how it went down. For exemple, a knife kill will splatter blood around and on yourself. Blood splatters can be cleaned with tissue/towel. They can only clean so much and need to be washed at water sink for further use. You can also wash bloody weapons at sink. Items can be discarded and hidden. Current available exemple is garbage. Putting an object in the garbage makes it less likely that it will be found during investigation. Items can be picked up and dropped wherever you want. So you don’t need to destroy evidence, you could also place it in misleading locations. I made a beautiful chart illustrating some of the above possibilities. Could have discarded the lab coat in garbage or simply leave it in a room as a misdirection. Clearly simply washing yourself is the simpler solution, but I want “Observant” NPC to be able to see through it (low odds, might be influenced by stats). Also note that some events/objects are in different rooms. Travelling between room unnoticed will be the biggest challenge. You won’t Know where the NPCs are (well you can kind of figure out some stuff, but its not shown). Evidence includes the body, but the body is quite tricky, if its bloody, it could let blood puddles as you move around. Its also very incriminating to ever be seen with it and it slows you down. In the end the goal is to make it so other people would be just as likely (in possibility) to have committed the murder by making it occur somewhere they have been, you obviously were there too, but ideally no one else would know. That or the other extreme, leaving so little evidence that a good judgment can’t be made. Thats all for now, I think it covers the basics but I feel its missing "something". So I might revisit it add stuff, change stuff, ill be sure to keep you updated. How is this looking? Any ideas, feedback, suggestion? I find him adorable! But its also a reminder that he needs to go! This would be game 3 in my collaboration post. I can't stress enough that this is all still early. If I can't find anyone right now, I'll be sure to ask again when the game is much more complete. on the current status of the game: It really is hard to make "visible" progress now, im working a lot under the hood. I also jumped a lot from part to part so I think that once I manage to complete my next entry (moving around) I should start facing the biggest challenge of this game. Turning evidence into context sensitive full sentences with variation. As always, feedback, suggestion and even comments are appreciated. Looks like a cool game. What are program are you coding this in, and what platforms are you planing to release in on? Interesting concept! I'm assuming it's singleplayer but whodunit mysteries are also very interesting to explore in smaller multiplayer experiences, that's one of the reasons why I enjoy Space Station 13 so much. But now I'm off on a tangent. Anyway, I look forward to see where this will go. Welp, I guess I could only keep my deep dark secret for so long... I use Game Maker Studio, GML. I am targeting PC atm. Im not familiar with Space Station 13 but multiplayer is something that was brought up to me, and something even I considered. However I'll admit that I lack the skill & knowledge to make such a game. It also wouldn't work really well with what I have in stores. I also doubted a "nobody" like me could generate enough of a community to make it worthwhile. I appreciate the interest nontheless. I just managed to make the inter-room fast travel (the hard part being NPCs noticing your and the other NPCs movement), I'll make sure it works right before working on an entry for it. I'm still open to any interested artist, open to cover-up suggestions or anything really!